Hydroponics holds many people in a suspended sense of some awe and much fascination. After all, how can you grow plants without soil? Must be another marketing trick, surely? Well, hydroponics has been around since before the middle of the last century. It didn’t start with the Hanging Gardens of Babylon as many would believe but with experiments carried out by the US Dept. of Agriculture, which were later given a boost during the war when the US Army had the logistical problem of feeding their troops in the South Sea Islands with fresh vegetables. They used the pristine white beach sand together with clear water from the volcanic mountain streams and applied water soluble minerals to it. The result was that their troops probably ate better than any others during the course of the war. It’s important to know that the sand used had no nutritive content and nutrition came solely from the water soluble minerals. The sand had the sole function of anchoring the plants. Not much has changed since and the principles applied are much the same as those in use today. 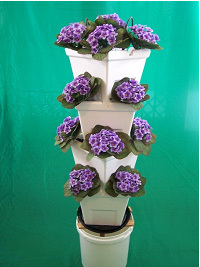 Of course today there are many different methods of growing plants hydroponically such as in grow bags, in vertical towers (Verti-Gro), gravel beds, Nutrient Film Technique (NFT), reservoir growing – known as Deep Water Culture (DWC) and aeroponics. The popularity of a particular method depends upon the ease of availability of the materials and their related costs. NFT is easily available and is cost-effective, grow bags too are easily obtainable and cheap, Verti-Gro pots are available locally and are moderately cheap and take up much less space than other systems so are highly cost-effective. 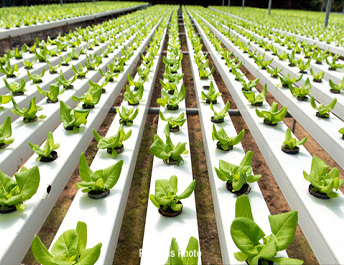 Reservoir growing requires expensive water-proof dams to be constructed under fixed light penetrating buildings, and aeroponics requires high cost housings and water collecting methods, often not available outside first world countries. Hydroponic growing of vegetables can take place in one’s own back yard and there is even a Hydroponic kit available in which to grow 16 different herbs that only occupies 1 square foot of space. This is ideal for flat dwellers with a balcony, or houses with verandahs or patios that maximise the need for space. DaisyFresh holds monthly courses in hydroponics where you can learn about hydroponics and put your knowledge to good use to start a commercial venture, or get a job working for a hydroponic farm, or start up your own system in your back yard and grow vegetables for the dinner table. The beauty of hydroponics combined with Verti-Gro is that you could site your garden on a concrete floor and grow 30 plants per m2. Whichever method you choose for hydroponic growing you’ll find it a most self-fulfilling past time.